To determine the RefID of a specific object on the PC, enter the console, and click on it. The RefID will be displayed at the top of the console window. To determine all RefIDs of an item, follow these steps in the CS/CK. 1. Find the item in the Object Window. 2. Right-click on it then choose "Use Info". 3. Double-click on each line in the "Used in these Cells" section of the Use Report window. If there are no lines in this section, the object is not present in the game. 4. 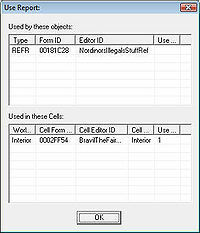 Locate the item in the Cell View window and read off the Form Id. This is the RefId you want. This page was last modified on 24 October 2012, at 11:53.